Lawrence P "Yogi" Berra was born on May 12, 1925 in St. Louis, Missouri, and played American Legion junior baseball. He picked up his nickname from a friend who said he resembled a Hindu holy man (yogi) they had seen in a movie. Berra served in the US Navy during World War II. In February 1944, he sailed for the British Isles on the USS Bayfield, where he was as a gunner's mate on board a rocket-launching landing craft in the D-Day invasion at Omaha Beach, "It was just like a Fourth of July celebration," he later recalled. 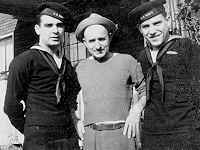 Berra also served in North Africa and Italy, and was sent home to the United States after suffering a hand wound. He was then stationed at the New London Sub Base until his discharge. 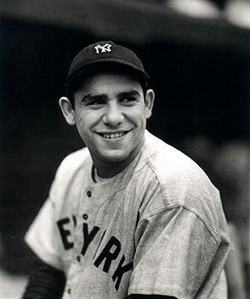 Berra played minor league baseball with the New London, Connecticut team after leaving the Navy and was promoted to the Newark Bears of the International League before being called up for seven games with the Yankees in 1946. The following season he played 86 games. By 1948 he was the New York Yankees' first-string catcher. Berra played 18 seasons with the Yankees, was a 15-time all-star, a three-time MVP, and appeared in 14 World Series. Berra was a coach with the Yankees in 1963 and managed the team in 1964. He returned to coaching with the Mets in 1965 and took over as manager in 1972. In 1984 he became manager of the Yankees. He has also coached with the Astros. His son, Dale, was an infielder with the Pirates, Yankees and Astros in the 1970s and 1980s. Yogi Berra was elected to the Hall of Fame in 1972. Created January 13, 2007. Updated March 4, 2008.